Mega Man Zero 4, known in Japan as Rockman Zero 4​ (ロックマンゼロ4) in Japan, is a video game developed by Inti Creates and Natsume and published by Capcom for the Game Boy Advance (GBA) handheld. It is the fourth and final title in the Mega Man Zero subseries of the Mega Man franchise. The game is set several months after the events of Mega Man Zero 3. The game deals with Dr. Weil's reign over Neo Arcadia in which humans, who have been reduced to second-rate citizens, begin to escape in large numbers to the last known livable location on the planet, Area Zero, beginning a conflict between the two groups. The effects of this war eventually drive Zero and the Resistance to protect Area Zero and its inhabitants from Dr. Weil. The fourth installment of the Mega Man Zero series introduces gameplay changes, but doesn't deviate platforming of its predecessors. Players guide Zero through eight main selectable stages and usually a mini-boss to separate it into two parts. At the end of each level, the player faces one of the game's reploid antagonists. 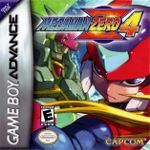 Besides the past ties Mega Man Zero 4 also includes a new Easy mode, not found in previous installations of the series, giving into responses that the Mega Man Zero series has been too challenging. In Easy mode, Zero receives a massive life boost, and can use the Cyber Elf without restrictions. However, Easy mode prevents the changing of the weather, and consequentially the acquiring of EX Skills. The player is still equipped with the Z-Buster and Z-Saber at default. However, in place of the Shield Boomerang and the rod-type weapon from the previous games (Triple Rod, Chain Rod and Recoil Rod) is the new Z-Knuckle that allows Zero to perform several actions, including hanging from pipes, destroying obstacles, stealing an enemy's weapon if Zero destroys it with the Z-Knuckle and acquiring special weapons in certain parts of a stage. Another new element is the weather system, which allows players to choose between two weather conditions for each of the eight main stages. The difficulty of the stage varies depending on the chosen weather condition, with the stage being harder if the weather icon has an orange border around it. Sometimes, there are secret passages in some stages which the player can only reach by setting the weather to "hard". The trade-off for an easier level is that Zero cannot learn an EX Skill from a boss. Cyber Elves, a core element of previous Mega Man Zero installments, are no longer required from the player. Shortly after the introductory levels, a Cyber Elf will arrive for Zero to equip. This elf has most of the powers of the all the Cyber Elves from previous games, which are unlocked as you raise its level by feeding it E-Crystals. Zero may select one power from each of the three categories: Nurse, Animal, and Hacker. The player's ranking at the end of a level is no longer given a penalty for using the Cyber Elves as long as they are kept under the maximum power limit. In addition to this, Zero can now equip body chips to enhance his abilities, including double-jumping and self-recovery, similar to early Mega Man X titles. Zero cannot rely on finding secret disks to give him enhancements as in Mega Man Zero 3. Instead players must collect enemy parts dropped randomly from defeated enemies. Recipes for combining these parts can be learned by talking to NPCs the player rescues and by talking with a Cyber Elf after its stages of evolution. However, the majority of the recipes are given not through conversation, and instead from random combination of parts. Source: Wikipedia, Mega Man Zero 4 , available under the CC-BY-SA License.